Barbara Bush, you’ll remember, said two years ago that “we’ve had enough Bushes” in the White House. She changed her tune last February. 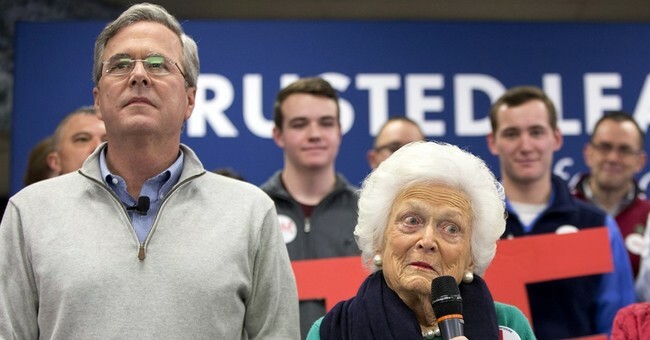 Now, she has made her endorsement even more official by joining her son Jeb on the campaign trail in New Hampshire this week to try and convince voters that the former Florida governor is the best man for the job. At one point, Mrs. Bush defined her son as the “nicest, wisest, most caring” candidate in the race. In an interview with CBS’ Norah O’Donnell, Mrs. Bush insisted someone with such bully-like behavior is not fit to be commander-in-chief. In particular, she criticized the businessman’s treatment of women. Mrs. Bush was referring to Trump’s insulting the Fox News journalist by saying she had “blood coming out of her wherever” during the first GOP presidential debate when the moderator asked him about his past demeaning comments about women. He insisted he meant Kelly’s nose was bleeding, but some women like Barbara Bush beg to differ and are of the mind he meant something a bit cruder. Jeb’s brother, former President George W. Bush, also added his voice to Jeb’s campaign. Number 43 appeared in a new TV ad highlighting Jeb’s resume. "Jeb will unite our country. He knows how to bring the world together against terror. He knows when tough measures must be taken,” Bush adds. “Experience and judgment count in the Oval Office. Jeb Bush is a leader who will keep our country safe." Will Jeb gain momentum now that he is getting more help from his family? I’m curious if, after Mrs. Bush’s comments especially, if Trump will dare to call her even half the names he calls her son.